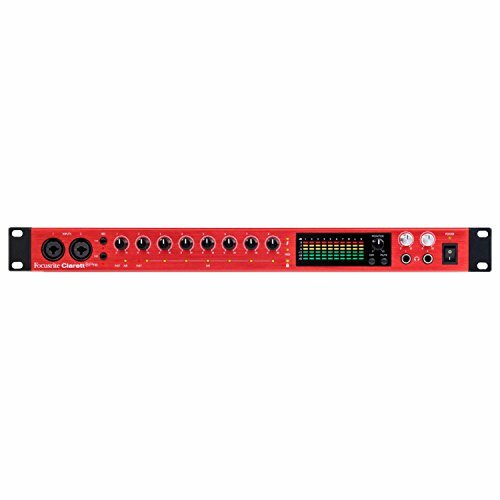 The first audio interface I recommend is the Focusrite Clarett 2Pre. Now this is a USB audio interface, and it has two mic preamps, so you can record vocals and acoustic guitar at the same time. And one of the very cool things about this audio interface is that it has an “air setting” on both of the preamps. So you press that air button in and it engages an emulation of one of FocusRite’s more expensive transformer-based mic preamps. So it gives you a little bit of character and tonality that’ll help just add some spice and again character to the tracks that you record through these mic preamps. Now this interface also has an ADAT input, which will let you route a number of external mic preamps into this audio interface So if you find that down the line you want to record drums with six mics or something that obviously is beyond the capabilities of these two mic preamps, you can just basically purchase another piece of hardware and then route it into this interface, and that’ll allow you to expand down the line depending on what your recording needs are. Now this audio interface includes quarter-inch outputs on the back so you can plug in your studio monitors, and it also includes really great plug-ins – some compressors, EQ’s – stuff that you can use in your DAW to make your mixes sound even better. Now this audio interfaces is just a great overall choice. So if you’re looking for a good workhorse audio interface that’ll tackle just about anything you can throw at it, this is the audio interface that I would recommend. The second audio interface I recommend is the Apogee Duet. 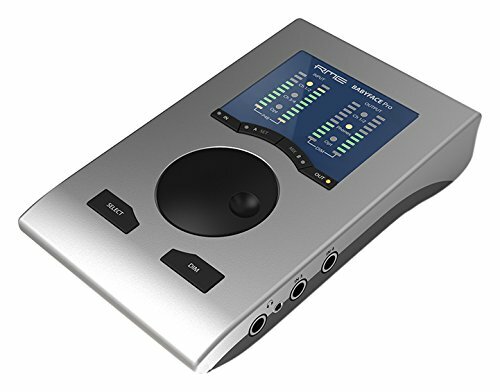 And this is also a USB audio interface just like the Focusrite one, and it also has two mic preamps. But Apogee is known for crafting really high-quality mic preamps and converters. They’ve been in the pro audio game for a long time, and this is their most accessible piece of hardware other than the single-channel preamp and audio interface. Now similar to the Focusrite, this also has quarter-inch outputs for your speakers, but one of the downsides to the Duet is that it does have a breakout cable on the back of the actual device itself. So you have to plug in a cable, and then that cable splits out into different plugs that you can use to either plug in your mics or your speakers in this case. Now one of the great things about the Duet is that it has really high-quality metering built right into the hardware unit. So right on the audio interface you can see what the levels are of the mic signals, and what the output levels are on your speakers, so it’s a great way to just visually be able to see very quickly – without going into your DAW – whether or not you’re too hot when you’re recording. And so I like this a lot because you can just adjust the levels right there, and see things very clearly. 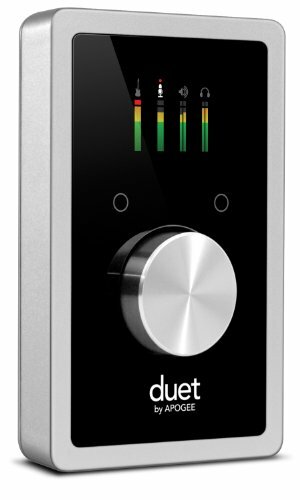 Now the Duet has a really sleek design so the hardware unit itself looks great, it’s made of really high quality aluminum, and it’s also got a great control panel software. So all the settings can be accessed from this control panel and you can adjust things like mic input volume and your speaker outputs right from that control panel as well. And one of the very cool things about the Duet is that you can actually plug it into your iOS devices. So if you want to do some recording on your iPad or iPhone, you can actually use the Duet with your iOS devices as well as your computer. If you can afford to spend this kind of money on an audio interface, you can’t go wrong with the Duet. I think it’s a cut above the Clarett in terms of high-quality preamps and converters, certainly just a great-sounding unit, and you can’t go wrong with Apogee. They’re just a fantastic company, so I would definitely recommend the Duet if you can afford to spend a little bit more on your audio interface. The last audio interface I recommend is the RME Babyface Pro. Now this is also a USB audio interface, and it’s actually pretty similar in design to the Apogee Duet. But the key difference here is that you don’t actually have to use a breakout cable on the Babyface. So all of the connectors are actually built into the hardware unit itself. So it’s a little bit more user-friendly in this respect because you don’t have a bunch of cables kind of flying out the end of it using this kind of flimsy breakout cable solution like the Duet. That’s the one thing I really don’t like about the Duet, and this problem is totally solved with the Babyface. Now one of the cool things about the Babyface is that it actually has four inputs. So not only do you have two mic preamps so you can record two microphones at the same time, but you also have two quarter-inch inputs as well. So if you want to plug in something like an electric guitar or an acoustic guitar with a pickup output or even a bass, you can do that at the same time and record everything in parallel. So it’s got a little bit more flexibility and control in this respect than the two other interfaces that I mentioned earlier. Now similar to the Clarett, this also has an ADAT input so you can expand the mic preamps down the line if you want to buy another piece of hardware and plug in another eight preamps, you can do that too with the Babyface. Now one of the things I love about RME is that their hardware is built to last. So I used to have an RME interface and it was rock solid It never failed, I never had problems with it I think RME is one of the best companies out there when it comes to building hardware that’s really built to stand the test of time. So if you’re looking for something that you can really depend on for years down the line that’s not gonna bail two, you know, years into purchasing, RME is one of the best companies out there for this. And one of the other main benefits to the Babyface is that it’s actually bus powered. So you don’t need a power cable with a big clunky adapter that you have to plug into your wall to power this unit. So you can just plug it directly into the computer, your Mac or PC, and it’ll actually run off bus power directly from your PC So no need for another clunky power cable clogging up your wall outlets. Now the Babyface is the most expensive out of the three audio interfaces we covered today. So it runs for about 750 dollars new, but if you’re looking to save some money on any of these audio interfaces you can usually find them used on amazon.